It is fruiting season in the orchard at Severn Valley Country Park. I wander between apple trees, ducking under branches. The leaves have a glossy green upper and a whitish underside. The colour of the leaves contrasts sharply against the rosy red apples. They are plentiful after the perfect growing conditions that we have had this year. I take one in my hand and, with a twist of the stem, pick it. All at once, I can taste the sweetness of the summer sunshine and the sharpness of the first autumn frost. The original wild ancestor of the apple tree is actually a native of the mountains of central Asia. Cultivation of the tree has taken place over many years. This has led to the huge range of different apple varieties that we see today. The most common varieties you might see on supermarket shelves are Braeburn (originating from New Zealand), Golden Delicious (from the USA) and Granny Smith (from Australia). The orchard at Severn Valley Country Park mainly contains apple varieties that were bred in England, such as the Blenheim Orange and William Crump. Local provenance fruit trees are often under threat because they are not commercially valuable. Supermarkets want fruit that is uniform in shape and size. It is, however, extremely important that local varieties of fruit tree are conserved from both a genetic point of view (it has implications for disease resistance) but also from a cultural point of view. These fruit trees are part of the fabric of our wonderful island. I continue to walk through the trees, harvesting the different apples. Some have perfect holes bored into their flesh, indicating where insects have burrowed into them. Others have already fallen to the ground. Brown mould is slowly creeping over the windfalls, mottled white with fungus. What the trees produce, the earth will take back. As they rot they provide food for insects such as wasps and butterflies; a final feast before they wither away with the winter. Eventually I have a mixed bag of apples. Before mechanisation on farms, more work would have been done by hand. Harvest would have been a busy time of year with long days out in the field gathering hay, crops and fruit. When the produce was all gathered, there would have been quite a celebration. Around Shropshire there are quite a few Apple Days in October to celebrate the annual fruit harvest, including one in the lovely surroundings of Coalbrookdale’s Greenwood Centre. The star of the show was an old apple press, into which the apple harvest was emptied. All the apples were then washed and macerated. The pulp was loaded into the press, between hessian sheets. Two clamps were then tightened to squeeze out the delicious apple juice. It was collected in bottles and handed out to the crowd of people in attendance. With music, dancing and stalls selling produce, this was a true celebration of everything that orchards represent. Different parts of the country are associated with different fruits. 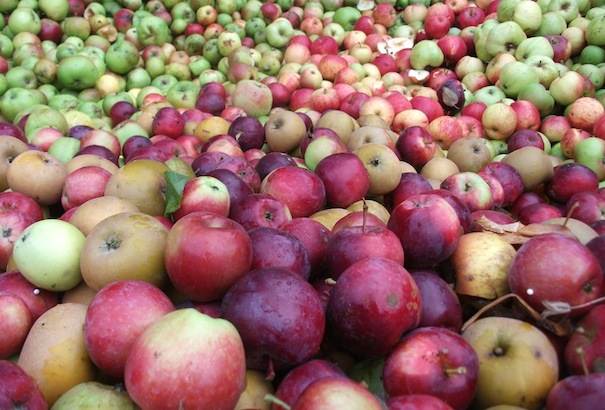 Pershore in Worcestershire was the home of the Pershore Plum, whilst Herefordshire is apple country. Just up the road from the Greenwood Centre in Coalbrookdale, hidden away behind a wrought iron gate is the National Damson Collection. Few people realise that the damson is our county fruit. Local volunteers have carefully nurtured the old damson trees and also planted young trees with names like Dittisham damson and Merryweather damson. There is even a variety called the Shropshire Prune. The wonderful thing about the orchard at Severn Valley Country Park is that it provides year-round food for wildlife. In February, with the ground frozen hard, bullfinches feed on the buds of the fruit trees. With the arrival of spring, the fruit trees come into blossom. This is a welcome nectar feast for insects emerging from hibernation. Throughout the summer, the blossom is replaced by the nectar source of wildflowers such as meadow cranesbill and meadowsweet. As autumn approaches the fallen fruit once again provides a welcome meal for badgers and butterflies, fieldfare and redwing. If you would like to help the orchard at Severn Valley Country Park to grow, why not plant a tree? For a small fee, a local provenance fruit tree can be planted on your behalf. If you are interested, please contact staff at the park on 01746 781192.